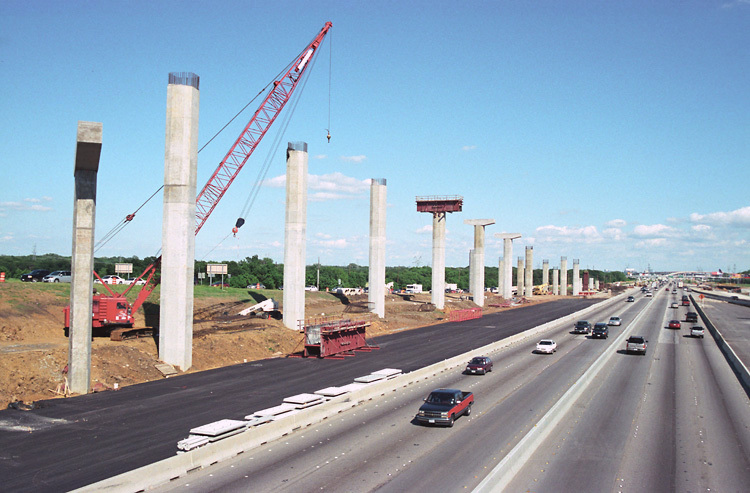 A long section of the SH 121 freeway main lanes are under construction, and another long section will be awarded in May and June of 2004 estimated at $158 million. 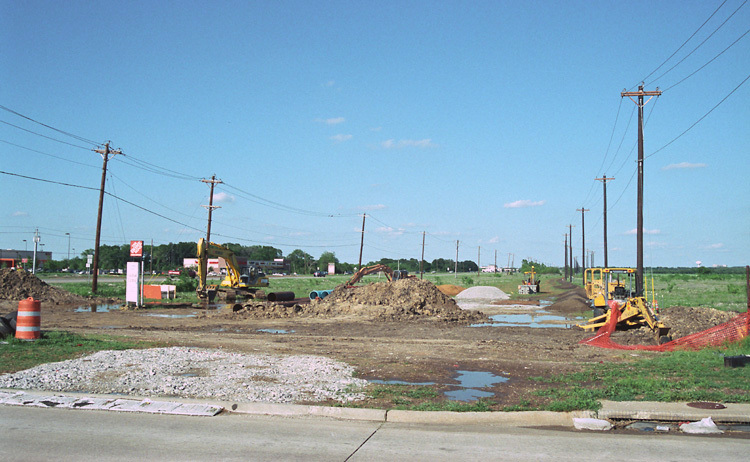 Frontage roads for the western section of this portion of SH 121 were constructed in the 1990s and are known as the Lewisville bypass. 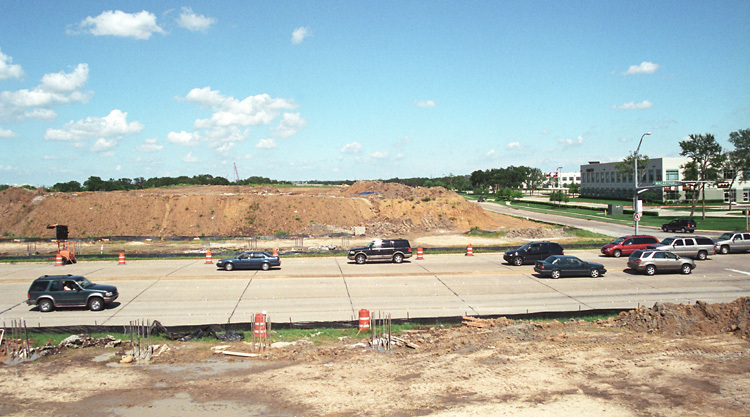 The area around SH 121 is urbanizing very rapidly. I recently took a drive north of SH 121 and was stunned by the amount of development in progress. Of course, all the new development is spawning traffic, which has made it necessary to build the freeway. This facility has always been planned as a freeway (rather than a tollway), and as far as I know this will still be a freeway. However, I wouldn't be surprised if TxDOT tries to toll it since the Transportation Commission is headed by a toll road fanatic. 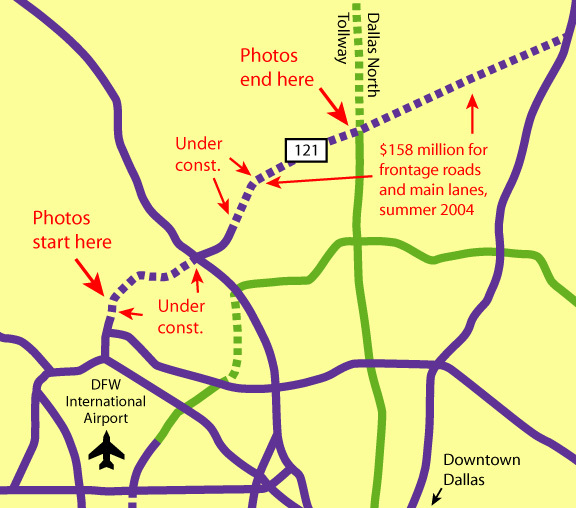 SH 121 traverses across the northern edge of the Dallas metropolitan area. The section under study here is from DFW airport to the Dallas North Tollway. We will start just north of DFW airport and proceed eastward. 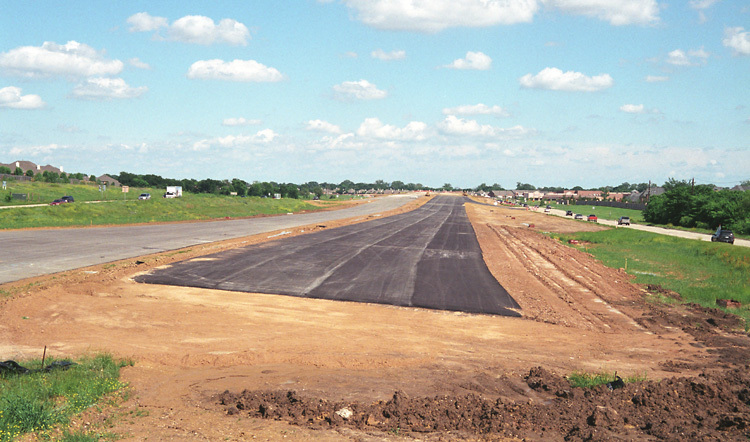 Main lane construction starts just north of DFW airport. This view looks east, west of Denton Tap road. This is the asphaltic base. The pavement will be concrete. Overpass construction at Denton Tap Road. Looking towards MacArthur Boulevard, with overpass construction in progress on the right side of the photo. 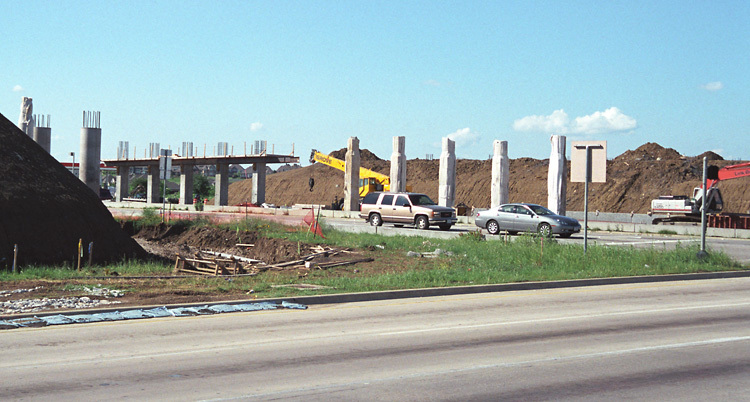 A five-level interchange is under construction at IH-35E. 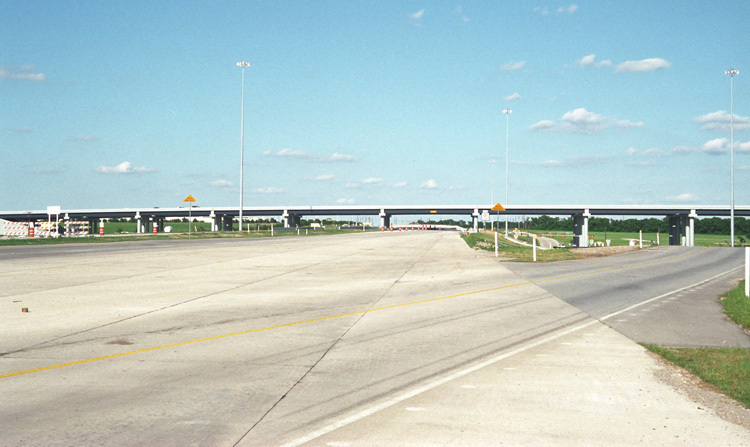 This view looks southbound along IH-35E, with the piers for a high-level connection ramp on the left side of the freeway. In this phase of construction, four connection ramps will be built. Moving eastward, here is the overpass at Hebron Road. This is just west of 121 business. The interchange with 121 business is just ahead. 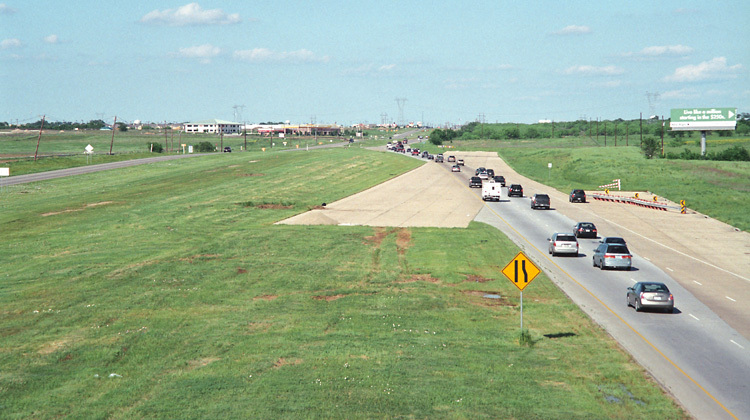 East of the 121 business interchange, SH 121 is back on its original alignment. This view shows a very short section of mainlane pavement that is in place. The same view as above, at a slightly different angle. 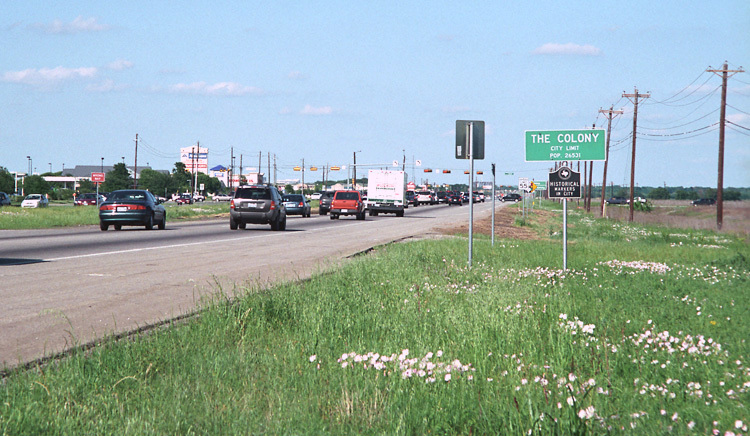 SH 121 is a four-lane divided highway with numerous traffic lights going eastward. An estimated $94.4 million contract will be awarded in May 2004 to build frontage roads and main lanes on this section. Utility relocation is in progress in preparation for the freeway construction. The row of telephone poles on the left shows the old right-of-way boundary. The row of telephone poles on the right is the new right-of-way boundary. The corridor is generally 400 feet wide. 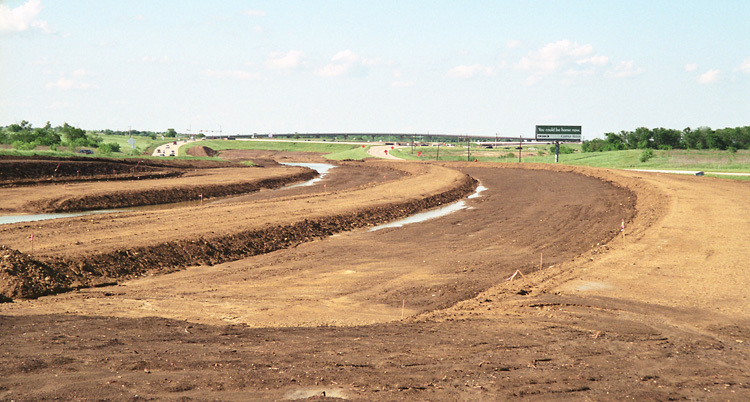 The interchange with the Dallas North Tollway was completed in April 2004. 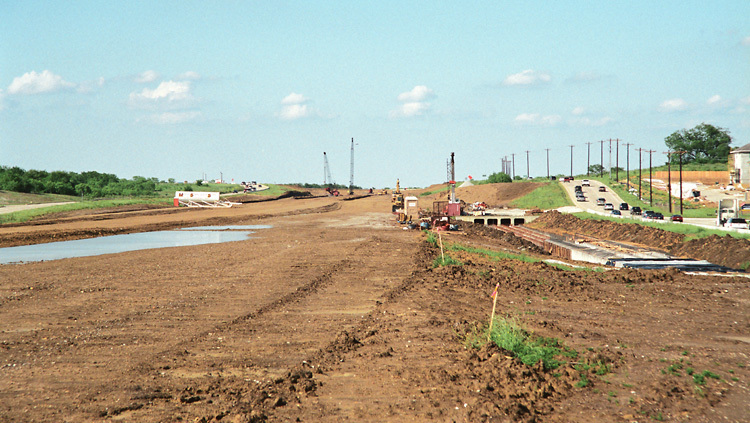 This view looks east, with the DNT main lanes crossing over SH 121. In the long run, direct connector ramps will be added here.